After a walk from the hotel (30 mins is a bit too far in this heat) we got to Aristotle University and completed registration for the conference. 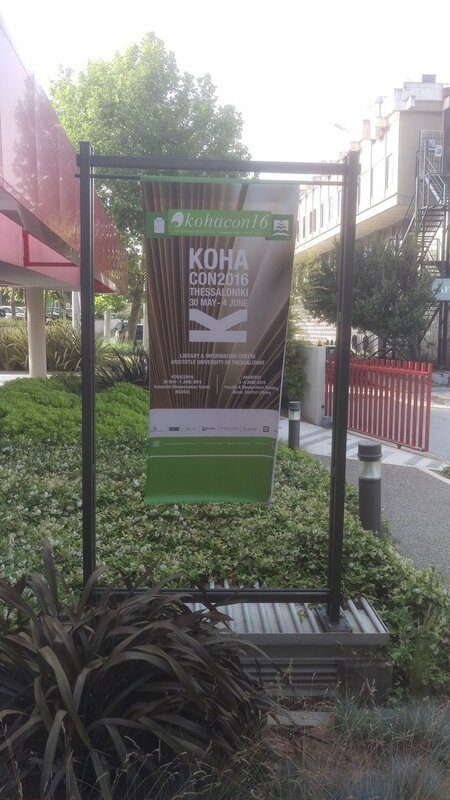 The first session for the day was a welcome to the conference, followed by Paul and I talking about the history of Koha. Giannis welcomed us all, more than 270 people registered from more than 30 countries. He made a point of thanking the University for their help. Then the Vice Rector of the University spoke about the university, and how it was 90 years old. As the biggest university in Greece, it is important to connect to the outside world, and that they were proud to host the conference. The head of the Libraries then spoke, unfortunately my Greek is non existent so I didn’t catch most of what she said. Giannis then thanked the sponsors, without whom this conference couldn’t have taken place.